Fun Dip is a candy manufactured by The Willy Wonka Candy Company, a brand owned by Nestlé. The candy has been on the market in the United States and Canada since April 1942, and was originally called Lik-M-Aid. It was originally manufactured by Sunline, Inc, through their Sunmark Brands division, which was purchased by Nestlé in January 1989. 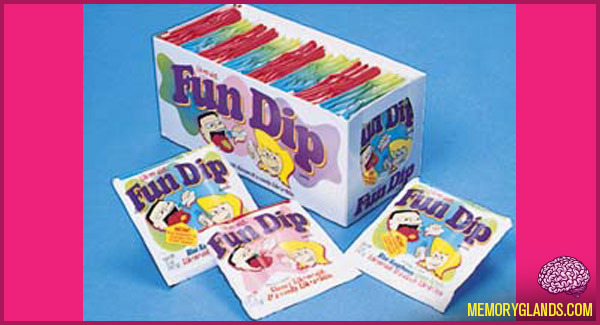 The candy was then rebranded as Fun Dip, and added to the Willy Wonka product line, although it retains the Lik-M-Aids subtitle in a diminished presentation. Fun Dip is similar to fellow Wonka product Pixy Stix, but sold in small pouches, rather than paper or plastic straws. It generally consists of three packets of flavored and colored sugar, along with two edible marshmallow flavored candy sticks called “Lik-A-Stix”. It is intended to be consumed by licking the sticks and using the moistened stick to collect some of the sugar. While the original flavors consisted of lime, cherry and grape, the most common flavors are cherry, grape, and a raspberry/apple combination that turns from blue when dry to green when wet with saliva. It also comes in sour flavors, including sour watermelon, sour apple, and sour lemonade. There is also orange flavored Fun Dip. Packets with one stick and two flavors were once the standard, and packets with only one or two flavors are still available with less prominence than the now-standard three-flavor package. The Lik-A-Stix were introduced in the 1970s. The stick resembles a flat stick of white sidewalk chalk. Recently, fruit-flavored stix were introduced, unsuccessfully.